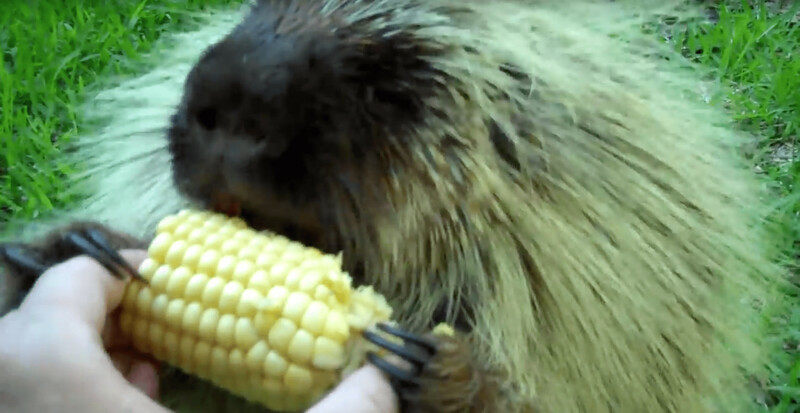 She hands a porcupine some corn, but when she asks for it back, you have to listen to its response! In this instalment we get to meet a cheeky porcupine called ‘Teddy Bear’, Word of warning however, while Teddy Bear might sound like a cuddly snuggle fest, we advise you treat with caution as he can be a little prickly at times. In the video below, posted by Zooniversity1, we’re first introduced to Teddy, before the owner hands him a corn on the cob, from the reaction I think its fair to say, teddy is a fan of corn. At this point all is going well, teddy is chowing down and all is well in the world. That’s until the owner askes if she can have a little corn too? Teddy doesn’t seem overjoyed with this idea and the noise he lets out left me in stitches. Having grown up with two siblings I can completely sympathise and I’m sure in my 29 years I’ll have let out a similar noise myself.